On IdeaLab stage, 62 teams from Estonia and other countries presented their business ideas. Each had 2-3 minutes to explain their business idea to the audience, point out its novelty, users of the product and the amount of money needed by the team to develop the idea further. Seven competitions took place – Kaleidoskoop finals, the final round of STARTER programme, Prototron TOP 10, EstLat-Accelerate, Cocoon, Est-Fin Pitch Match Startup Wise Guys TOP 10 and sTARTUp Pitching. 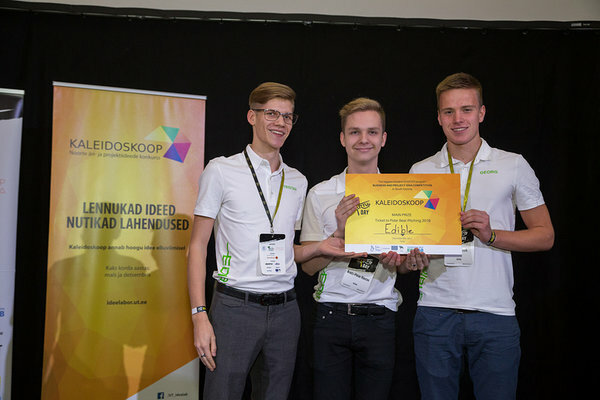 Kaleidoskoop winner was Decomer Technology, who received tickets to the European Innovation Academy in Portugal as an award. Decomer Technology develops bioprotein-based bioplastics, which they currently use for packaging honey. Bioplastic dissolves in hot tea water and is not harmful to health, therefore it is an eco-friendly and convenient alternative to sugar. The University of Tartu prize went to the team Edible, who go to Oulu Polar Bear Pitching, where they have to pitch in an ice hole. Edible is a student company that produces edible and biodegradable eating utensils. Tartu City Government’s monetary prize was granted to the team Seniorship, who plans to offer traineeship and retraining opportunities for the elderly. Four teams previously selected in Tallinn and two selected on the same day in Tartu (incl. Decomer Technology and Espuro, who also competed in Kaleidoskoop finals) made it to the final round of STARTER, which also culminated in presentation of awards. 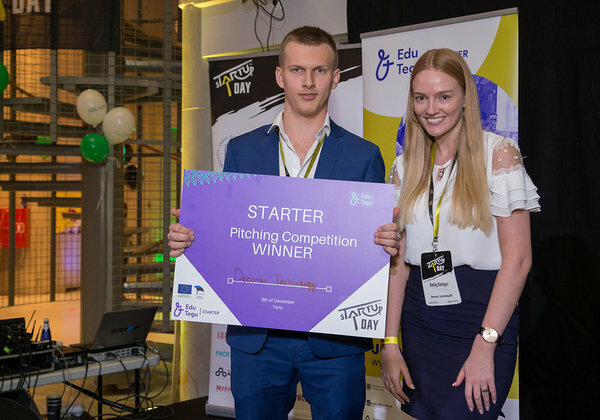 The international jury decided that the best STARTER team was Decomer Technology, who got an opportunity to pitch on sTARTUp Day main stage with five best teams, and tickets to the Arctic15 business festival. “Before sTARTUp Day we were very excited and although we were quite confident, it was impossible to predict the jury’s decision in such a tough competition, so we held our breath until the announcement. Emotions were running high after winning the first prize, the possibility to participate in the EIA programme in Portugal is awesome and gives a great boost to our startup. The further victory and tickets to Arctic 15, as well as the opportunity to pitch on the main stage added to our enthusiasm and it was nice that our idea was successful with so many people,” said Mart Salumäe, co-founder of Decomer Technology. According to IdeaLab manager Maret Ahonen, this was the largest ever pitching marathon in Tartu. “You do not have many possibilities in Estonia to present your business ideas to such a large international audience. Therefore, in a way, all who pitched were winners. Besides, there were so many interesting events during the day. sTARTUp Day was an excellent opportunity to exchange experiences and make new contacts,” said Ahonen. STARTER programme is supported by the European Social Fund.